Over the years, weed lovers have come up with interesting and creative ways to consume weed. Currently, the most popular method of consumption is by the use of a bong. 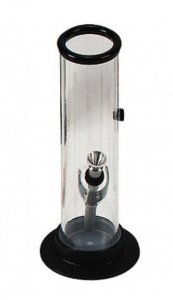 A bong is simply a water filtration unit that works to cool the smoke as well as filter out harmful and dangerous hydrocarbons produced during the burning of the weed. 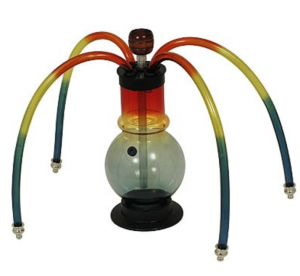 Being the recent craze, bongs are available in all sorts of shapes, materials, and sizes. With this great diversity, there are some that are more functional than others. Of the many types of bongs, acrylics features in the top 3 position. It has managed to hold down this position courtesy of its numerous benefits over its competition. 1 Why Should You Choose Acrylic Bongs? Why Should You Choose Acrylic Bongs? Well, acrylic bongs have many advantages over glass bongs with regards to price. Sure you can spend hundreds on a fancy and beautiful bong. But you should know that a handcrafted bong most often than not does not mean functional and practical. That said, acrylic bongs are not only cheap and affordable but also durable. They are far much better suited for travelers compared to glass bongs which prove to be quite fragile. Whether you are a veteran weed smoker or a newbie, an acrylic bong is something you should have in your weed smoking collection. And now without much ado, let’s get right into the reviews. Now, no one should ever have to smoke alone. You can do it, but doing it with your friends is far much more enjoyable and exciting. But most bongs only allow for single person use. Or if you are willing, you can share the bong. If this grosses you out, you will be pleased to note that you still can get high with your friends. The Acrylic 4-Hoser Bong is designed for this very purpose. 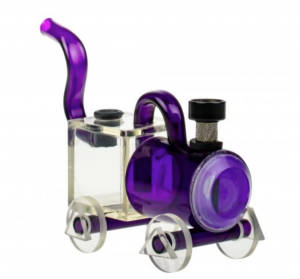 With this bong, everyone can have their very own tube and smoke to their hearts fill. With the individual pipes, smoking can be done simultaneously. The 4-Hoser features a simple design and measures 36m in height. This makes it perfect for a party. The four tubes that are included in the design of this long are easily detachable. This makes cleaning a breeze. Additionally, the unit features a large wooden bowl which can easily be replaced with another bowl of your choice with ease. It comes with four hoses in total and is perfect for small gatherings. This acrylic bong at first may feel thin and flimsy. After a while of using it, you will not even care about its thickness. The only fact that will matter to you is its large bowl and the ability to get high with friends simultaneously. Are you in search of a conversational piece? One that will strike up a conversation with your friends and family once you unleash it and place it on the table? If the answer to these questions is a resounding yes, then you should, by all means, purchase this Acrylic water pipe. It has been designed to resemble a miniature American train. In addition to resembling on, it is important to point out that it also hits like one. While it may be a rather small bong, it does come packing a hit. The bowl is just the right size, and the main thing is that this piece is effective and cheap. But despite its low and affordable price, it is great quality and exudes novelty. The design without a doubt makes the bong cool, fun and exciting to smoke from. The design, aside from being beautiful also allows for easy cleaning. All you will need to have an easy time is a few Q tips and some cleaner, and you will be good to go. The bowl and the downtube are metallic. The mouthpiece, base and rubber grommet are a basic part of the bong. If you are a huge fan of large items, then this bong is just what you need. The unit measures a whopping 38-inches tall. This bong packs a big punch. While you use this unit, you should let it fill and then take a rip and allow yourself to be carried to cloud nine and beyond. You should do all your best to try and clear the unit in just a single hit. If you manage to do this, you are guaranteed to be soar to the clouds (not literally of course, but you get the idea). This colored and tall acrylic bong comes with two hoses. As such, you can soar to the clouds with your partner in crime. Assembling this unit proves to be an easy feat. All you need to do is attach the hoses to the height of the unit, and you will be good to go. The unit features a carb. However, you can always duct tape this hole if you prefer to smoke from a carb-less bong. It is a fact that this bong is tall, there is no denying it. And while its tall and large size may be a good thing with regards to providing you with better hits, it can prove a challenge to clean. It, however, is not too difficult or impossible to clean. All in all, this unit is perfect for a small gathering. A party of two is perfect. Simple and cheap are qualities that most often than not go hand in hand. It is as such not shock to learn that this simple in design bong fetches a low and affordable price. As a matter of fact, given that it is the simplest in this list, it also is the cheapest and most affordable on this list as well. If you have been smoking blunts and joints for a while, and are tired of it, this is a great way to upgrade and improve your smoking experience. 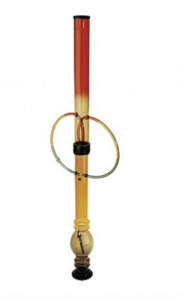 This bong with its simplicity can help usher you to the use of other complex smoking devices available. In itself, the bong is rather small. It features a cylindrical design and features a carb hole as well as a rubber stopper. With these built-in features, you get to control the concentration of the hit you get. Additionally, its small and compact nature makes it easy to transport. However, caution should be exercised given its fragile nature. For those guys who hate cleaning duty, you will be glad to note that courtesy of its simple design and minimal accessories and curves, this bong is easy to clean. Last but not least, the base is wide and black. It provides the unit with ample support and stability. This is yet another bong featuring a simple design. This bong features a bubble base bong. It features a great grip on its shaft which contributes greatly to the overall grip of the unit when holding the unit. A bong has never before felt so secure in the hand. 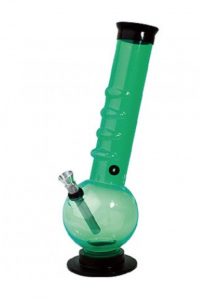 This bong features a green hue which is quite beautiful. It sports a mouthpiece, and the base is not attached to the glass. This affords you the privilege of changing out this unit. But at the same time, it makes it a rather painful process to secure the bong. But some glue will work just as great. This bong is small and features a reasonably sized bowl and smokes great. The overall design is simple. Its simplicity makes it easy to clean. Compared to its predecessor, this is a significant upgrade in design, performance, effectiveness, and price. Without a doubt, you get value for your money. And there you have it – a complete list of the 6 best acrylic bongs to choose from. Acrylic bongs are considered a perfect alternative for glass bongs and plastic bongs alike. They are perfect for starters and professionals alike as well as parties depending on its design and accessories. However, it is unfortunate that there isn’t a great variety to choose from. But from the above list, you are bound to land the best unit in the market.